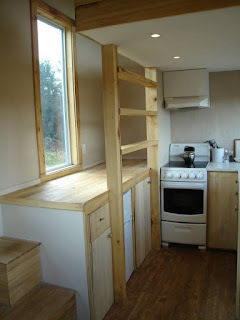 This blog started as I did the research to build my own non-toxic tiny house. For a quick overview and tour of my house here is a Q&A and sneak peak. The exterior siding is cedar, sealed with a non-toxic finish. The insulation is XPS. 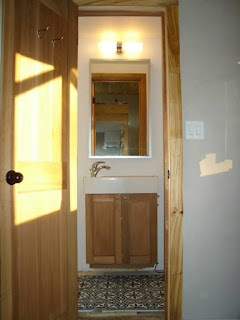 I used low odour poplar wood throughout the interior of the house. The floors are stained with natural pigments and finished with hemp oil. The windows are custom sized aluminum frames. The countertops are quartz. 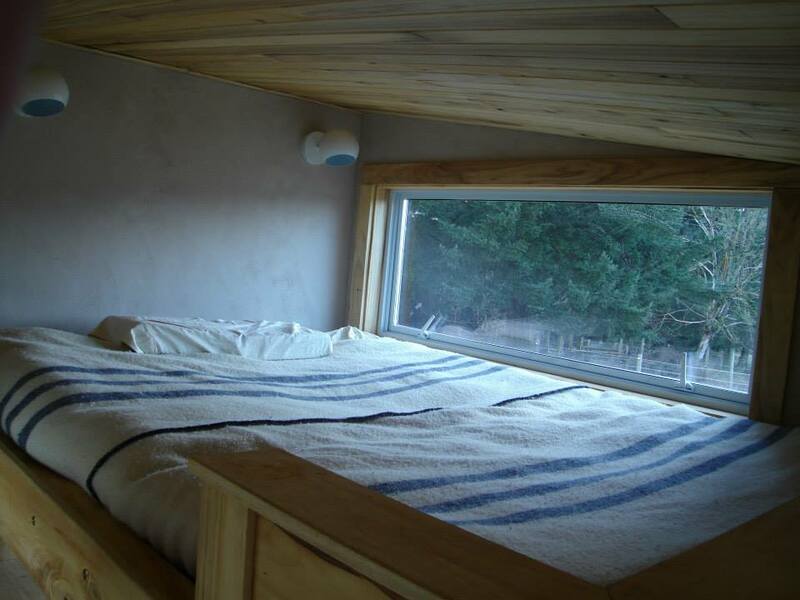 The walls made of magnesium oxide board are finished with a natural clay plaster. In the kitchen they are sealed with a non-toxic finish. I use a 100% wool mattress with chemical-free blankets. The bathroom has a custom made aluminum shower and the floors are concrete tiles. I use a composting toilet to be semi-off the grid. More about my electrical, heating and water systems can be found here. Beautiful website and home! How much did your house cost to build? Wood does not go mouldy with the right humidity levels. If I were to do it again though I would not use a wood frame. I would use metal. Can you explain why would you choose metal? Presumably because metal does not mold. Thanks for all the interesting links. We always search for great sites to share with friends, many of whom do not know mold is causing their illnesses. A note on insulation, I saw on one of your links that builders use Ultra Touch denim insulation. We just ripped out about $900 worth of Ultra Touch because something in our camping setup bothered me. Once we removed it, the problem was gone. 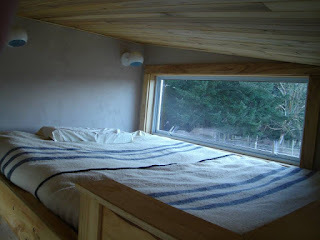 So we replaced the cherry tongue and groove walls, left the space empty, and put some wool blankets on the walls as wall hangings for the next camping excursion. Don't know what we'll do for insulation for those walls, but no denim insulation. Something similar happened in a spare bedroom, but I had thought it was water intrusion. But this is an aluminum car hauler. We rebuilt the bottom of the floor with metal sheet, added metal studs, and put a cherry tongue and groove floor on top. Highly recommend. Btw, poplar causes odd physical issues with me. If you used ozone on this house set up, I wonder if it forced a fast offgassing of the poplar and made it less reactive for you. Denim wasn't the best choice. I did end up replacing it. I was OK with poplar. Ozone doesn't help reduce the smell of wood but only makes it smell strange if you really blast it. What did you replace the denim with? Thank you. What about maple wood? 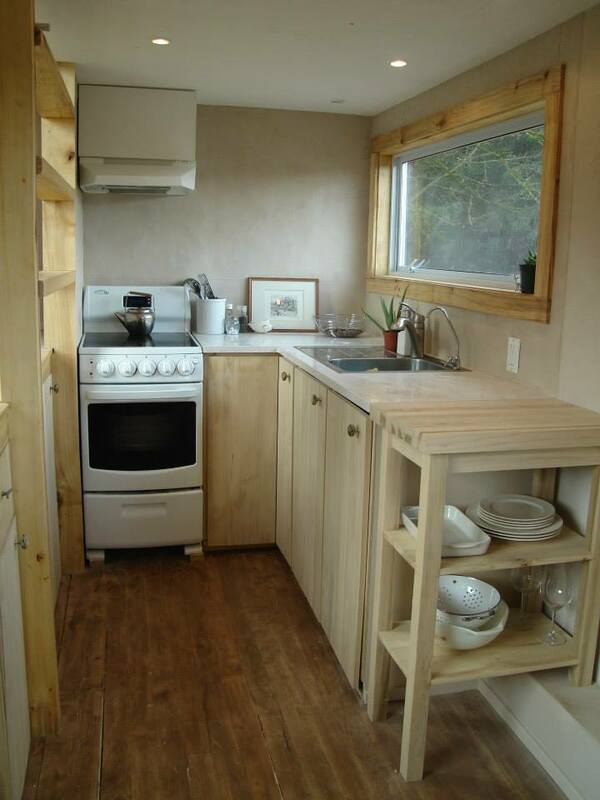 I was in an RV that had maple cabinets, and I didn't smell a thing. Thank you! Say, what about moving the toilet to an outbuilding? Though I must say your current setup is absolutely charming! What type of Medicine cabinet did you get? I'm thinking of getting one finished in heat cured acrylic paint or anodized aluminum rust free finish. Not sure if both are healthy options. Thanks. Do you have any building plans? Or where might I find building plans? Thank you, I love the design of the house. And I love that it has high ceilings, I'm 6'7 and this looks like a house I could live in. Nice house! However, I am surprised that you installed aluminum window frames. We have seen more mold on them than vinyl. How are yours doing? Do they get condensation on them? No no condensation or mould on them! It took much longer than I thought it would but my son and I finally built my teeny tiny home travel trailer. It's 7' x 12' because I felt nervous towing something 8' wide behind my Jeep. I do have a 6' patio that folds up when traveling and down when parked. If I were to do it again (and I will) I'd go with the 8' width and a 14' length. The curb weight of my trailer when empty is probably around 1200 lbs but it can handle 4000 lbs and my Jeep can tow 5000 lbs. A lot of people with MSC have older model cars that they have had for years. A light weight trailer can be towed with these vehicles. 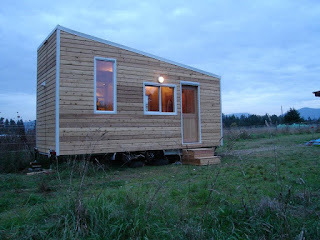 I consider my first little trailer (which I love in spite of its short comings) my prototype to teach me what NOT to do. 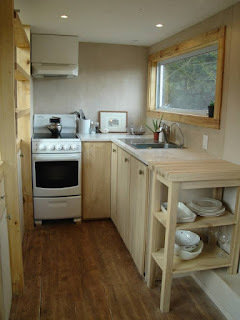 I plan to create a non-profit (or work with an existing non-profit) to build non-toxic MCS safe tiny travel homes for others that will be affordable (most MCS sufferers have exceptionally low incomes.) My niche will be a light weight non-toxic tiny homes that can be easily towed. Most important I'll be working on establishing community land trusts for tiny home communities. Post it here when you have it. It's something that is quite hard to perfect. There are many trailer companies out there and some build for MCS but not many have got this figured out yet in terms of moisture and mould and leaks. Everything leaks eventually, but some structures are built better than others. I'm on my third version of a little 6x12. But I would not put this out there as plans. I will update my post about it so others can see what I did. But it would take a lot of engineering and building science expertise as well as many prototypes before developing something that is really going to last. Having said that I do think you should put your ideas out there to share. Why is XPS non toxic? It is explained in the post on insulation. There is also a youtube video within that post where I explain my thoughts on the different foams if you prefer to watch instead of read. I am curious so many wood in the house, will they grow mold in the wood? this house is above ground, does the house have draining system? where does those water from kitchen, and toilet go? does it require city approval? If you decide move out of this chemical free house, will you able to sale it or rent it out? Hi Susan, I no longer live in this house. I live in a regular apartment right now. 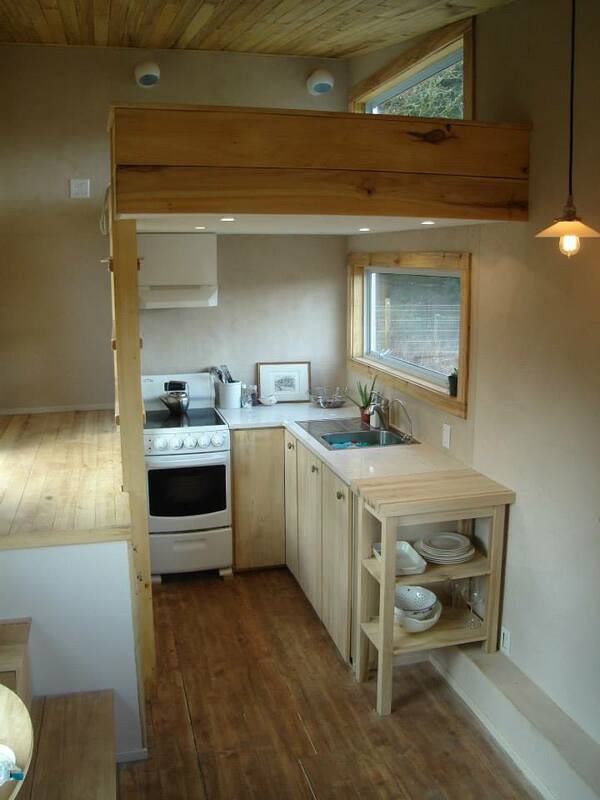 The post called tiny house systems explains the water and drainage. Wood will not mould no, the right wood for the climate. Indoor humidity should stay low no matter where you live.